Sultry restaurant featuring steaks and chops in an artsy downtown Orlando hotel. : The Grand Bohemian Hotel Orlando prides itself on bringing together high-class and eclectic works of art for its in-house galleries. This artful theme extends to The Boheme restaurant, located just outside of the piano lounge that hosts an Imperial Grand Bösendorfer piano and where guests can enjoy a few drinks at the bar area before dinner as well as live jazz on the weekends. 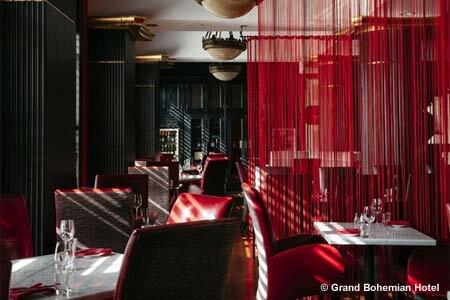 Inside The Boheme, lush red velvet banquettes and white tablecloths set a romantic, sultry vibe. Under chef Laurent Hollaender, the menu has undergone a transformation, with dishes including the signature calamari complemented by a curry and cumin aïoli; coffee-marinated beef medallion steaks; and savory New Zealand rack of lamb served with a goat cheese polenta cake. Pair your meal with any of the fine wines from the restaurant’s extensive cellar.